When a writer creates a nonexistent, fictional object, that creation has a life beyond the immediate page. Readers sympathize with or loathe characters, and long to visit fantastical places. Have you ever wished that you really knew Lisbeth Salander or Atticus Finch? Or that Rivendell existed so that you could go there next spring break? Fictional realists argue that theoretically, all of those places and people do exist. It’s probably best to get this out of the way right off the bat: the concept of fictional realism is more philosophical in nature than anything else. The idea is to consider what defines “fictional” versus “nonfictional” existence. I apologize if I got anyone’s hopes up, but you’re still not getting that Hogwarts letter in the mail. This view entails, among other things, that to say, for instance, that some white elephants exist is to say that some white elephants have the property of existence (or, to put it the other way around, that not all white elephants are nonexistent)—a consequence that might strike some as strange. Since one cannot simply walk into Mordor, it doesn’t actually exist. People hold objects without physical referents to be true all the time. For example, the United States is no more a physical object than Middle Earth is; it may be a country with land, and people, and a government, but what makes it the United States is an agreed upon ideal. Otherwise, it would just be a hunk of earth. No one would debate that the dotted lines on a map represent real boundaries between states, and yet they have no physical referent. “Modal realism” is a viewpoint that favors the existence of fictional objects. One of its most well known supporters was the philosopher David Lewis, who argued that actuality is indexical; in other words, like our white elephants, the realism of fictional objects can vary based on our understanding of them. Basically, what Lewis is stating with these tenants is that just because a world is not our own, we cannot claim it to be any less "actual" than ours simply because we currently inhabit one and not the other. 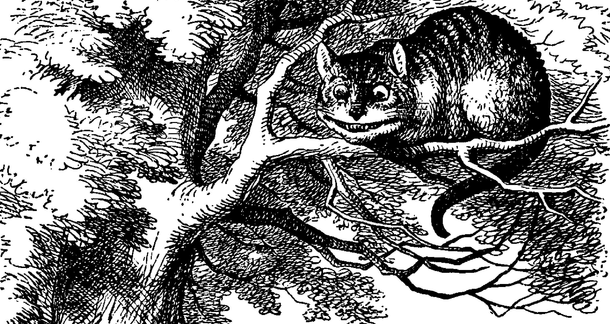 If there was ever a book meant as a parable for modal realism, it's Alice in Wonderland. Theorists have long argued that Lewis Carroll, a published mathematician and logician, based much of his famous book on philosophical concepts. Although David Lewis had yet to be born when Alice first ventured down the rabbit hole into Wonderland, his theories hold some echoes of Carroll's reflections on the nature of reality. While Wonderland shares many characteristics with Alice's native England, its laws are often incomprehensible to Alice. Biting into a foreign substance might cause her to grow to monstrous heights, or to shrink to the size of a mouse. Carroll's world differs in content, not in kind, supporting the second modal tenant. As this HubPage notes: "Whether Wonderland is real or just the product of a man’s imagination, Carroll proved that there isn’t one linear way of interpreting reality." One issue with modal logic is that while actual worlds are referred to with the possibility operator, fictional worlds are not. Interpretation: since one cannot simply walk into Mordor, it doesn’t actually exist. If you walk into the United States, your feet will be touching solid ground. Actual worlds don’t need to depend on us for their existence. No matter how you look at it, the fictional object has no physical referent; only a pretended referent. Another major criticism of Lewis's theories is that they are vulnerable to Occam's Razor, a principle which favors the simplest solution to a hypothesis in the absence of certainty. And there is no certainty where fictional worlds are concerned. But the reality (haha, reality) is that this is merely a compilation of a select few arguments regarding a highly complex subject. What much of the conflict boils down to is whether “existence” must be defined by a physical reference point, and it’s possible to spend an eternity contemplating without an answer. Check out some of the references below if you want to make your brain feel like boiled cabbage. To be determination that fiction should be nothing but reality should be left to Hard Science Fiction. Meanwhile, I'm going to go play some Space Opera. Interesting, because one of my books takes place in a world I made up (Altrovorsum). I didn't believe that Altrovorsum and its cities and culture and people existed before, since I made it all up. I agree with the Mordor thing--the only way I can really enter Altrovorsum is by picturing it in my head, or by re-reading. Most of the story takes place on the outskirts of the capital city, Bellum Pacem, which has no vegetation, is very hot most of the year, and is filled with sun-scorched, hard boulders.